Last month, while I was driving down the Mississippi River on a magazine assignment, I had a curious experience in Rosedale, Mississippi. As I was eating lunch in a place called Leo’s Market, a waitress mentioned that Rosedale is the place where the legendary bluesman Robert Johnson sold his soul to the devil in exchange for musical genius (an event alluded to in — among other places — the Cohen brothers’ movie Oh Brother, Where Art Thou). As if to prove it, the waitress handed me a wrinkled, typewritten transcription of a “vision” about Johnson’s fateful moment that had appeared to bluesman Henry Goodman as he was traveling the road from Rosedale to Anguila. For the sake of posterity (and because I have never seen it elsewhere), I am publishing Goodman’s “vision” in full below, as well as a postscript by Rosedale’s Crossroads Blues Society. Interestingly, there are other contenders in the myth of Robert Johnson’s devil-purchased soul — and the crossroads of US 61 and US 49 in Clarksdale is where most blues tourists pay their respects (the newest Romantics album is called “61/49” for this reason). Of course — as with ancient Roman tourists setting off to find “sites” from Greek myths — the location of Johnson’s crossroads is not exactly something that can be proven. He was born in Hazelhurst, and his supposed grave is in Quito (near Itta Bena) — but Rosedale did figure in the lyrics for one of Johnson’s most famous songs, “Traveling Riverside Blues”. “Traveling Riverside Blues” had a huge influence on rock-n-roll, and was remade as “Crossroads” by Eric Clapton — which mentions Rosedale with the same phrase Johnson uses. It was also covered by Led Zeppelin (whose more well-known “Lemon Song” famously steals a lyric from that same Johnson tune: “You can squeeze my lemon ’til the juice runs down my leg”). The dog lets out a low, long soulful moan, a howling like never heard before, rhythmic, syncopated grunts, yelps, and barks, seizing Robert Johnson like a Grand Mal, and causing the strings on his guitar to vibrate, hum, and sing with a sound dark and blue, beautiful, soulful chords and notes possessing Robert Johnson, taking him over, spinning him around, losing him inside of his own self, wasting him, lifting him up into the sky. Robert Johnson looks over in the ditch and sees the eyes of the dog reflecting the bright moonlight or, more likely so it seems to Robert Johnson, glowing on their own, a deep violet penetrating glow, and Robert Johnson knows and feels that he is staring into the eyes of a Hellhound as his body shudders from head to toe. People say that the crossroads where Robert Johnson made the pact with the devil is in Clarksdale where Highway 49 intersects with Highway 61. But, as can be seen from the events described above, that’s not the case. The crossroads, the one and only crossroads, where the Delta Blues emerged as a manifest entity in the person and music of Robert Johnson is at the south end of Rosedale where Highway 8 intersects with Highway 1. This will be disputed, as some people will dispute that Robert Johnson ever even made a deal with the devil. But the preacher man, Son House, knew. Even though he wasn’t a preacher. And, if Son House were alive today, he would set the story right. 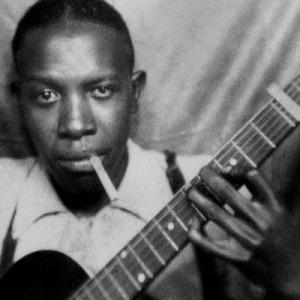 Truth is, nobody was there when the deal went down but Robert Johnson and the devil. This statement will likely cause some people to say ‘well, just where in hell did the events described above come from if nobody was there to witness them?’ A reasonable question about a spiritual event. Realms must be observed. Or, at least, felt. The events described were witnessed in a Vision. With a capital “V”. Not just any vision, but a visual spiritual experience more real and true than the reality and truth encountered on a day to day basis in the everyday physical world in which life goes on. A spiritual Vision about a spiritual event. Both in the same realm. Plus, the devil hangs close to the Mississippi River, and putting down his “X” as far away from the River as Clarksdale is simply something that would not happen. Voodoo oozes from New Orleans for a reason. There will be always naysayers and doubters. But most of these can be counted among those people who would have you “define” the Blues. Well, you can’t define the Blues. You feel the Blues, you are seized by the Blues. You are possessed by the Blues. The Blues is music like a Cadillac is a car, There’s just more to it than that, a transcendence, an essence unmeasurable, unspeakable. The essence of Rosedale is the essence of the Delta Blues. Rosedale is not just a delta town. Come on down and see. The Crossroads Blues Society is headquartered in Rosedale at Leo’s Market, sitting alongside Highway 1 where Highway 8 intersects. Right across the Highway from where the log was so many years ago. Right at the spot where the Devil put the “X” and sat to wait on the soon-to-be Great Robert Johnson. Where else could such a Society be headquartered except here? The Crossroads Blues Society is dedicated and devoted to celebrating and experiencing the Delta Blues. There is no understanding or defining the Delta Blues, but experiencing the blues, feeling the blues, theorizing about the blues, discussing and talking about the blues, and listening to the blues – all spiritual experiences of differing decrees of intensity – is the mission of the Society. This occurs in Rosedale. And when this occurs in Rosedale, you are riding in a Cadillac, top down, with Robert Johnson at your side. The source of the Delta Blues is this crossroads in Rosedale. Rosedale is the City of the Blues. The Blues have been in the Mississippi Delta forever, hovering over the land like an ether, a vapor. The Blues ware here before Hernando DeSoto, before the planters and their slaves, even before the Indians, who were indeed floating down the Great River when DeSoto “discovered” the Mississippi. How so, Hernando? DeSoto discovered the Mississippi the same way John Handy discovered tie Blues before jumping on a train for Memphis in Tutwiler. The Blues and the River were already there. And people still don’t and never will understand either one nor the essential connection between them. Both can be experienced in Rosedale.